Supporting both IPv6 and IPv4 protocols, the GS-5220-48T4X helps the SMBs to step in the IPv6 era with the lowest investment as its network facilities need not to be replaced or overhauled if the IPv6 FTTx edge network is set up. 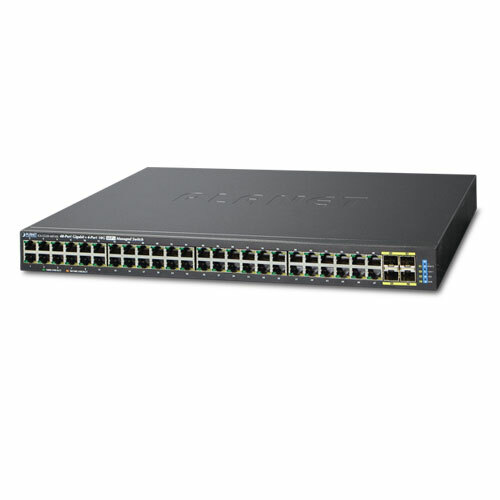 The GS-5220-48T4X switch not only provides ultra high transmission performance, and excellent layer 2 and layer 4 technologies, but also layer 3 IPv4/IPv6 VLAN routing feature which allows to cross over different VLANs and different IP addresses for the purpose of having a highly-secured, flexible management and simpler networking application. The GS-5220-48T4X can be programmed for advanced switch management functions such as dynamic port link aggregation, Q-in-Q VLAN, private VLAN, Multiple Spanning Tree protocol (MSTP), Layer 2 to Layer 4 QoS, bandwidth control and IGMP/MLD Snooping. Via the link aggregation of supporting ports, the GS-5220-48T4X allows the operation of a high-speed trunk to combine with multiple fiber ports and supports fail-over as well. The GS-5220-48T4X offers a comprehensive layer 2 to layer 4 Access Control List (ACL) for enforcing security to the edge. It can be used to restrict network access by denying packets based on source and destination IP address, TCP/UDP ports or defined typical network applications. Its protection mechanism also comprises 802.1X Port-based and MAC-based user and device authentication. With the private VLAN function, communication between edge ports can be prevented to ensure user privacy. The GS-5220-48T4X also provides DHCP Snooping, IP Source Guard and Dynamic ARP Inspection functions to prevent IP snooping from attack and discard ARP packets with invalid MAC address. The network administrators can now construct highly secured corporate networks with considerably less time and effort than before. The GS-5220-48T4X is loaded with powerful traffic management and QoS features to enhance connection services by SMBs. The QoS features include wire-speed Layer 4 traffic classifiers and bandwidth limit that are particular useful for multi-tenant unit, multi business unit, Telco, or Network Service Provider’s applications. It also empowers the enterprises to take full advantages of the limited network resources and guarantees the best performance in VoIP and video conferencing transmission. The GS-5220-48T4X Managed Switch is equipped with console, Web and SNMP management interfaces. With the built-in Web-based management interface, the GS-5220-48T4X offers an easy-to-use, platform-independent management and configuration facility. The GS-5220-48T4X supports standard Simple Network Management Protocol (SNMP) and can be managed via any management software based on standard of SNMP protocol. For reducing product learning time, the GS-5220-48T4X offers Cisco-like command via Telnet or console port and customer doesn’t need to learn new command from these switches. Moreover, the GS-5220-48T4X offers secure remote management by supporting SSH, SSL andSNMPv3 connection which encrypt the packet content at each session. The four mini-GBIC slots built in the GS-5220-48T4X series support dual speed as it features 100Base-FX and 1000Base-SX/LX SFP (Small Form-factor Pluggable) fiber-optic modules. Now the administrator can flexibly choose the suitable SFP transceiver according to not only the transmission distance, but also the transmission speed required. The distance can be extended from 550 meters to 2km (multi-mode fiber) up to above 10/20/30/40/50/70/120 kilometers (single-mode fiber or WDM fiber). They are well suited for applications within the enterprise data centers and distributions. The GS-5220-48T4X supports SFP-DDM (Digital Diagnostic Monitor) function that greatly helps network administrator to easily monitor real-time parameters of the SFP, such as optical output power, optical input power, temperature, laser bias current, and transceiver supply voltage. By means of improving the technology of Optical Fiber Ethernet with highly-flexible, highly-extendable and easy-to-install features, the GS-5220-48T4X offers up to 10Gbps data exchange speed via Optical Fiber interface and the transmission distance can be extended to 10km. The GS-5220-48T4X is the ideal solution for data centers, enterprises and SMBs to build redundant connection and establish high bandwidth for server farm. With the built-in robust IPv4 / IPv6 Layer 3 traffic routing protocols, the GS-5220-48T4X ensures reliable routing between VLANs and network segments. The routing protocols can be applied by VLAN interface with up to 128 routing entries. The GS-5220-48T4X is certainly a cost-effective and ideal solution for enterprises. 2015-01-23 1.1 Release for GS-5220 series. 2014-09-19 1.0 Initial release for Command Guide.